You would think with that kind of title I would have something to say… Not so much today; I’m just trying to get the hang of blogging! 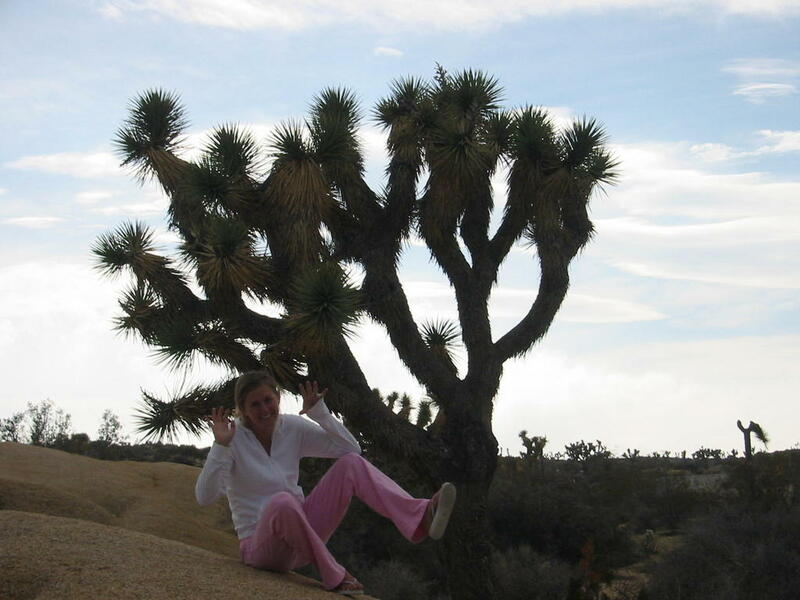 And, I love the picture of my wife imitating a Joshua Tree! I have a picture of myself trying to look cool (no doubt a subconscious reference to the the U2 album)… But, I don’t know how cool I look, and I do know how much more fun it is to look at my wife. I know that I am working on getting an entire congregation to pray for the kids in my youth group (That is what I do, I’m a Youth Pastor). It is humbling, tiring, wonderful, and tedious. I know that I read about 8 reviews of “Velvet Elvis” (a trendy new Christian book); it is incredible the amount of hate the Christian Community can generate all by itself, towards itself. I’m not judging or condemning… no, I am, but I’m not going to blog about that. The whole thing just made me sad. I still bought the book for the third time (I keep loaning it out, then wanting to continue reading). Alright, my last paragraph will be devoted to why I am trying (and kind of think most Christians should also) to stop recommending books to people. First of all, is that really what our friends and aquaintances need? Jeff Fox says we need a better Jesus, not better books. I can only think of one or two times I successfully even got someone to read a book I recommended, and the most glaring example is a friend who TOTALLY missed the point of the book and followed it to ever greater pain in that area of his life. I mean, don’t you think we should spend that time (The time where we tell them how awesome this book is and how it is THE BOOK that we can give to everyone who doesn’t know Jesus) listening to our friend? If we’re in such a hurry that we can’t listen to them, we have to recommend a book to save time (this is me to a ‘T’!!! ); then we don’t get to recommend anything because we’re obviously not loving them well! And, that is the only place to begin; whether the friend knows the Lord or not. Furthermore, can’t we set a better and higher bar? Seriously, there are some great books out there! But, instead of just recommending them and moving on; shouldn’t we learn to listen better (to the friend and to the book) and then share the message of whatever book to our friend in a subjective, sensitive way that they can hear without having a Barnes and Noble Discount Card? I think that is a better and a higher bar. And finally, I have found that there are people who are so excited about their faith that they are ASKING for recommendations. By all means, we should point these young men and women (usually in college) to the great stuff that is out there… But, waiting on them to ask means we are waiting until we have the right (by listening and loving them well) to recommend. What we should actually DO, for those of you who want the application… Is ask them what they think we should read. Then, we should ask again, discuss that book with them (whoever ‘Them’ is), and repeat the process until they are blown away by how interested we are in them and in their heart! A strange soapbox to have you say? I totally agree!